B&Bs or Guesthouses offer a great, often cheaper, holiday accommodation than hotels. They are generally smaller establishments and can provide more of a personal touch than large hotel chains. 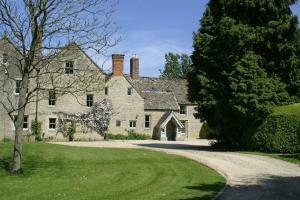 You can choose from 16 Bed and Breakfasts in Wiltshire. If you know the town within Wiltshire you want then the menu on the right will filter the results. Manor House Bed and Breakfast - With pleasant rooms and free Wi-Fi, The Manor House is in the middle of Rodbourne, surrounded by 1000 acres of farmland and 5 miles from the M4. 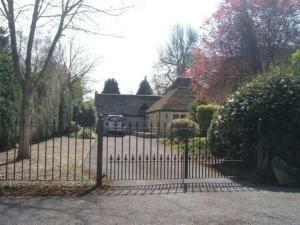 Rodbourne is located on the edge of the Cotswolds and is about 30 minutes from Bath, Bristol and Swindon. The historic house has bedrooms with bathrobes, toiletries, fresh milk and Freeview TV. Malmesbury Abbey and Abbey House Gardens are about 2.5 miles away. Fab! East Wing Bed And Breakfast - In an acre of private gardens, just a few minutes from the river and historic Bradford on Avon, this charming bed and breakfast boasts free Wi-Fi, free parking and stunning views. The East Wing Bed and Breakfast has great views from the house and garden and is just minutes from the River Avon and the Kennet and Avon Canal. The many attractions of Bath and Bristol are within easy reach by car, by bus or by train. Small and intimate, the East Wing has just 2 rooms and offers friendly, attentive, personal service. The 2 attractive double rooms have lovely views of the garden and share an adjacent luxury bathroom. Each room has a TV, an iPod docking station and a DVD player, with a large selection of DVDs available. Guests can help themselves to tea and coffee from the kitchen and breakfast room. For walkers and cyclists, there are numerous possibilities on the doorstep. Elbury House Bed & Breakfast - With a beautiful, peaceful location in 6 acres of gardens, this charming, family-run bed and breakfast offers free Wi-Fi, spacious double rooms and wonderful views of Bradford on Avon's countryside. 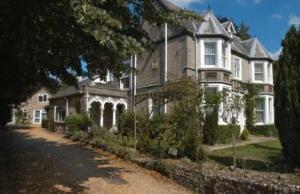 Surrounded by tranquil fields and lush, green paddocks, the Elbury House Bed & Breakfast is small, quiet and intimate. The large rooms have magnificent views and charming little extras, including full hospitality trays, complete with wine glasses and corkscrews. Each room has a TV, a radio and a hairdryer. Free Wi-Fi is available throughout. The delicious farmhouse breakfast includes eggs from Elbury House's own hens, freshly cooked on the traditional Aga stove. Free, private, on-site parking is available for guests. Newton Farmhouse - Set within 3 acres of grounds, this 16th century Grade II listed farmhouse is a traditional, romantic getaway within a 12-minute drive of Salisbury and 5 minutes of the New Forest. The hotel offers 5 four-poster beds across 8 comfortable, elegant rooms and a superb breakfast every morning. Complimentary internet access is available. Enjoy the gardens where there is a trampoline and a swimming pool. There are 2 fantastic pubs in the village which offer home-cooked food and a friendly welcome. Cricket Field House - A mile from Salisbury city centre, this 4-star (AA) B&B is in its own beautiful gardens, well situated on the A36 for Stonehenge, Salisbury Cathedral, Old Sarum and Longleat. Cricket Field House is totally non-smoking. Each individually furnished room is en suite and has tea/coffee, a hairdryer, a flat-screen TV and Wi-Fi. Rooms are in the main house or the pavilion annexe. The house has a well-equipped meeting room and free private parking for 30 cars. A hot snack menu is available from Monday to Friday (14:00-20:30). 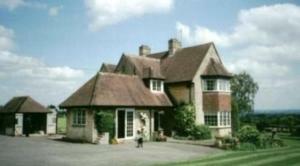 In 2009, Cricket Field House won the Visit Wiltshire Tourism Award at the South Wiltshire Business of the Year Awards. Guyers House Hotel - Located between Swindon and Bath, Guyers House is a friendly and relaxing 17th-century house with free parking, fresh food, and impressive leisure facilities. The elegant rooms feature en suite bathrooms, tea and coffee facilities and a TV. Free Wi-Fi is accessible throughout, and many have scenic garden views. 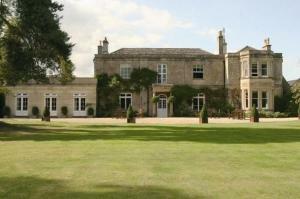 The building is set in 12 acres of scenic gardens and grounds surrounded by farmland. For leisure, there is a hard tennis court, a croquet lawn, a fitness room and cricket and golf nets. Guyers House offers exceptional food and wine, featuring produce from the kitchen gardens and orchard. The restaurant offers lunches and evening meals, and the varied menu uses fresh local ingredients. Guyers House is 10 minutes from junction 17 of the M4, and combines traditional charm and modern amenities. It is an ideal venue for conferences, training and meetings. The Swan Inn - This 150-year old coaching inn features individually designed, stylish rooms, real ales, and fresh, local cuisine. Set within the picturesque Wylye Valley, ancient Salisbury is just a 10-minute drive away. The Swan Inn's beautifully decorated rooms all boast colourful and modern individual furnishings with tiled, private bathrooms and toiletries. Rooms also enjoy lovely views of the River Wylye and surrounding countryside. Guests at The Swan can enjoy award-winning breakfasts made with all local produce, or fresh, home-cooked meals from the seasonal menu or specials board in the restaurant. The Swan's traditional, wood and flagstone-floored bar offers a range of real cask ales and an extensive wine list. There is also a riverside garden, where it is free for guests to fish, and a skittle alley. The ancient monument of Stonehenge is only 15 minutes' drive away, while the stunning 13th Century Salisbury Cathedral is a 10-minute drive. Free parking is also available. Byways House - Byways House is a large, attractive, central B&B in Salisbury, and has free Wi-Fi internet and a large, free car park. From Byways House you have easy access to the beautiful city of Salisbury, including the historic Salisbury Cathedral, Old Sarum, Wilton House, and local shops Full English breakfast is served in the mornings, and a vegetarian option is available. Rokeby Guest House - This Silver Award guest house is situated in an elegant Edwardian house in Salisbury and offers free Wi-Fi, free parking and luxurious bedrooms. There is a half acre landscaped garden which guests are free to use in the warmer weather. A hearty breakfast is served in the dining room, overlooking the garden and the beautiful conservatory. Rokeby is fully licenced with the purchase of alcohol available on request. The guest house is only half a mile from Salisbury Cathedral and the city centre, and 8 miles away from Stonehenge. Bath and the beaches of Bournemouth are only an hour's drive away. The Manor - The Manor is a beautiful Grade II listed historic house located minutes from Stonehenge and not far from Bath and Salisbury. Following a renovation, each bedroom has its own individual style and en suite bathroom. Modern comforts include a DVD player and an iPod dock. In the kitchen, local produce is used as much as possible to give a complete country-house experience.